Hopefully the lads won’t mind me putting this logo up! Click picture for link to race website! Ladies & Gentleman, if you want a bigger bike race, find a bigger planet. Quite frankly today I felt quite inspired by the tales of the 5th rider to join this fantastic endeavor. No matter how much I try to justify it, a Deca-Ironman is not a World Cycle Race (let us revisit in 2015) and as such I thought I would write a quick letter to invite all riders contemplating this special race to throw caution to the wind. Imagine the adventure. May I introduce you to the second edition of the World Cycle Race. It will cost you in the region of £10,000* and about 3 ½ months of your time. Frankly, you will endure some discomfort, and may even face some danger. On the other hand, you will have the rare privilege of taking part in a mission of great cycling significance, a feat immeasurable on any school reunion sheet, family reunion or facebook status update. The word ‘race’ does not do this challenge enough justice. This ‘adventure’ is how you will count yourself as you lay old & grey and full of sleep in some bedroom many years from now. This marathon will see you sweat, grind, push, touch, see, smell, drag yourself across 18,000 miles of the globe. 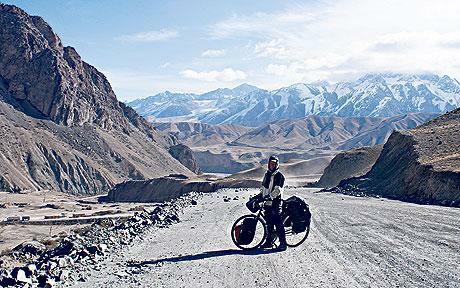 This is the toughest and the most rewarding bike race in the world. Period. Whether as a solo rider – just you and the road, endurance riding in its purest form – or as an office weary, inspiring pair or perhaps even as a rider with support crew in tow, the goal will be the same. When that gun cracks on the 1st March 2014 at 0800 at London, Singapore or Auckland, you will set out on a single stage, continuously running clock which will only stop when your mind & body laps our planet on your effort alone. And that’s a pretty cool story to tell your grandkids. Oh what wonders you will see. Never will you face worry or regret or fear in anything you set out to do for the rest of your days. By agreeing to join this race, you will, in a sense, establish yourself in the minds of your peers. People may cry out as you cross that finish line after many sleepless nights and lonely, silent miles, how you have sacrificed, shown heart, desire, determination, ridiculous hunger, all attributes we all strive to develop. But before I continue, let me tell you that is not why riders come to the start line. This is not done for self-admiration or pride. It’s a venture undertaken for the peril it presents, to experience the unknown. To test one’s self. For the seconds of disbelief as you wheel over a finish line which seemed so once distant. So let me finish with some words a close friend of mine once said [sorry mate, they are really good, it has to be included!] for those that are excited by the start date. Those that have chosen to embrace this lifetime challenge. ‘You MUST stay focused on this. You will be broken and want to give up. Don’t. Every time you hear that voice, listen to it. Talk to it. Tell it who is actually in charge. When your body is weakening and you are knackered tell your body who is in charge. That’s the only thing that will separate you from the others. Anyone can cycle this distance, even me. But winning it will take a determined mind, not fitter legs. Eat well, stay hydrated. And above all, never forget why you are doing this. This is your race. Your one chance to get into the area where you want to work. Quit, take too much time out, rest because you are hurting and you may as well just order more stationary for your desk now. You have to want this like nothing else. When you are beaten tell yourself “I chose this, I want this, this is who I am”. Get on your saddle and start going again. And 10 minutes later you will be a few miles closer to winning. 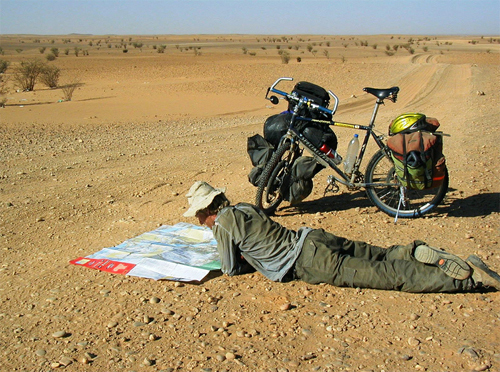 Find me a sponsor and I’ll ride, experienced bicycle tourist many 1,200-miles in 16 days from Seattle to as far south as Death Valley and back following archeological-historical stories on dirt and pavement, solo. Don’t expect to be able to ride, too poor to take the time off but best wishes to those that can.